This interactive training is designed to give you a working understanding of hypnotism. Each specific level of training unwraps the secret mystery of the ancient art and the modern science of hypnotism, and unlocks the subconscious powers of the mind. Our training is progressive and comprehensive in... universal communication techniques, the laws of human potential, and the great laws of mind which are the principles by which the mind responds and functions. 5) independent study, and 6) individual mentor coaching. Mind Spa Mentor™ proudly offers this professional Hypnotist Certification, which includes an internationally recognized core-curriculum established by the National Guild of Hypnotists, as a three-month progressive certification program. 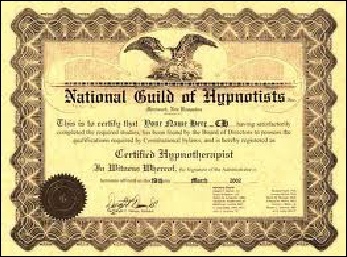 The National Guild of Hypnotists is the largest, oldest, and most prestigious organization of its kind, with approximately 12,000 members across the United States and globally in 73 other countries. Beyond the traditional hypnosis techniques, our course is further enhanced with even higher levels of competency in neuro-linguistic programming basics and clinical hypnotherapy techniques taught to you by your Certified Instructor. Each progressive level of training will automatically increase your hypnotism skills and results to develop professional self-mastery in helping others accomplish their personal goals. You will experience of the most in-depth and expansive preparatory programs in the country. Our ACCELERATED PROGRAM FORMAT will enable you to complete your training and certification process in three months. Taught in two-day blocks on two-weekends a month for three months. Each level of training builds the foundation toward certification. You must complete a total of six week-ends, plus self-study, which totals 150 hours of training, to receive your official certification. You will learn many skilful, therapeutic, and effective applications of your hypnosis training. Create hypnotic session strategy, establish pre-induction interview and rapport, with techniques to match your client’s personality. Important questions to ask, and establish client goal-setting statement. You will learn subconscious motivators, with introduction to NLP advanced communication hypnotic techniques. Learn client coping patterns with a cognitive behavioral stress test. Discover twelve most effective, therapeutic styles of hypnosis, and deeper hypnotic states of awareness. Practice with hypnotic scripts: in behavioral changes for stress relief, memory, smoking cessation, weight loss, insomnia, pain control, fear, mind/body healing, confidence, focus, and motivation. How to set-up your office, and up-to-date marketing tips to promote your hypnosis business. You will learn how the mind works. Explore hypno-cognitive psychology, personality archetypes, and hypnotic techniques for greater impact on client motivation and goal success. Upon completion of this training course, you will gain all the confidence you need to easily succeed in this practical and profitable profession. Graduates of our Hypnotist Certification Program report that... Their business has expanded, their effective has increased, and their life has improved – All because they now offer a new, powerful, unique approach in achieving multiple, sustainable, and duplicatable success! in your office from F.A.C.E.T.S. AMERICA (Foundation of Alternative Caregivers, Educators, Therapists, and Specialists) and N.G.H. (National Guild of Hypnotists), upon graduation by completing course requirements of attendance, documented case studies, independent self-study, and passing the written exam. 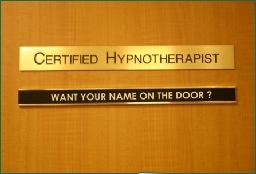 You are also professionally qualified to join other national hypnosis organizations. Patricia M. Armour is a practicing Master Hypnotherapist, a Certified Instructor with the National Guild of Hypnotists, Medical Hypnotherapist, Master Neuro-Linguistic Practitioner, and Hypno-Coach™. Patricia M. Armour has perfected her craft having successfully hypnotized several thousand individuals in private, one-on-one, customized hypnosis sessions to achieve personal success. She has been featured in Baltimore Magazine and The Journal of Hypnotism for her innovative work in the field. She has presented educational programs for professional certification by Johns Hopkins Oncology Center Postgraduate Program in Biopsychosocial Cancer Care and the Johns Hopkins University School of Continuing Studies in Health Care Counseling. She was chosen by the Citizen Ambassador Program – USA, to serve as a delegate to the People’s Republic of China in the field of Hypnotherapy at the 1994 Conference sponsored by the World Health Organization (WHO) and the Chinese Association of Science and Technology (CAST). She appeared on PBS television, the Wisdom Channel, and talk radio. She is a contributing member in several professional organizations in the human development and wellness fields. Do you need personalized flexible schedule, weekdays/nights? Do you prefer a private certification program? Contact Patricia Armour for special one-to-one training which can be individualized for your specific needs. An additional fee is assessed for private, individualized classes. national hypnosis organizations such as NGH and ABH. 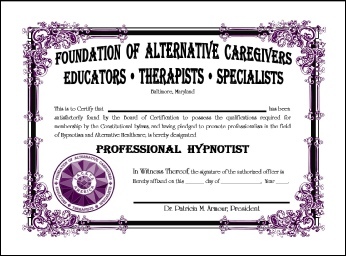 Professional Hypnotist Certification is $2,400 total payment. Fee includes all three levels of training. A non-refundable deposit of $200 is due two weeks before course starts. Class size is limited for extensive expert training and supervised hands-on practice sessions. Automatically exude Confidence and Charisma!